Alopecia is a common condition that frequently poses a challenge to pathologists and dermatologists alike. Its' classification is still evolving, and there are several areas of overlap. From the therapeutic and prognostic point of view, it is vital to discriminate between scarring and nonscarring alopecia. Histopathology is the most valuable tool in diagnosis. 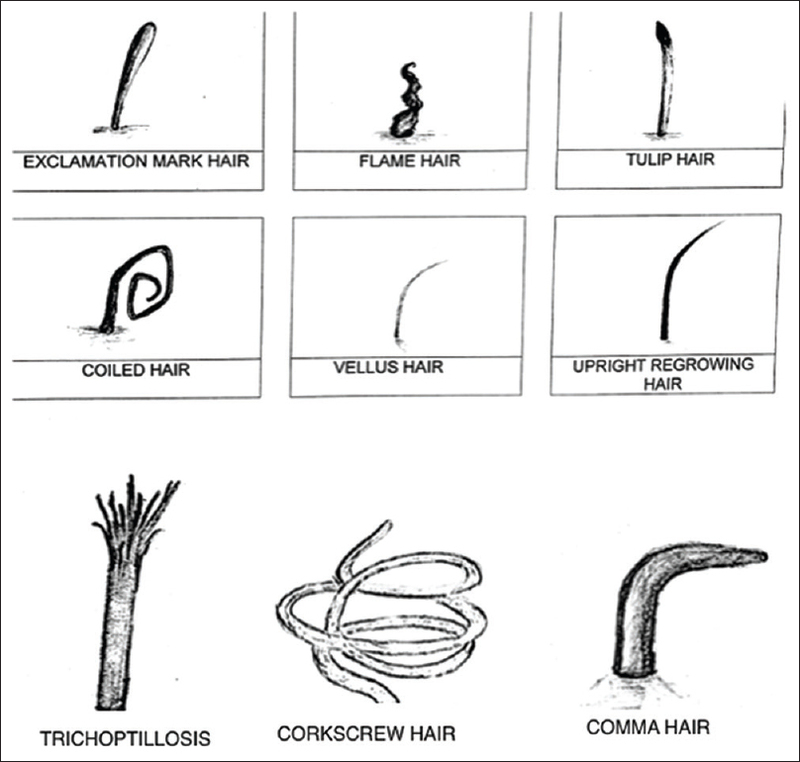 This review attempts to give an overview of hair anatomy and histology and discusses a simple, practical, microscopy-based classification of the commonly encountered diseases. It emphasizes the importance of examining the biopsy under scanning magnification, which is often overlooked and can provide vital clues. Some of the diagnostic challenges are also highlighted. Aims and Objectives: Papulosquamous lesions, the largest conglomerate of skin diseases, are characterized by scaling papules and plaques which amount to lots of confusion, and hence, a definitive histopathological diagnosis has a significant role. Our study was thus aimed at evaluation of correlation between clinical diagnosis with histopathological diagnosis of different noninfectious erythematous papulosquamous skin lesions encountered in a tertiary care center. Materials and Methods: A total of 50 cases of noninfectious erythematous, papulosquamous lesions prediagnosed by dermatologists of the same institute were included over a period of 1 year. 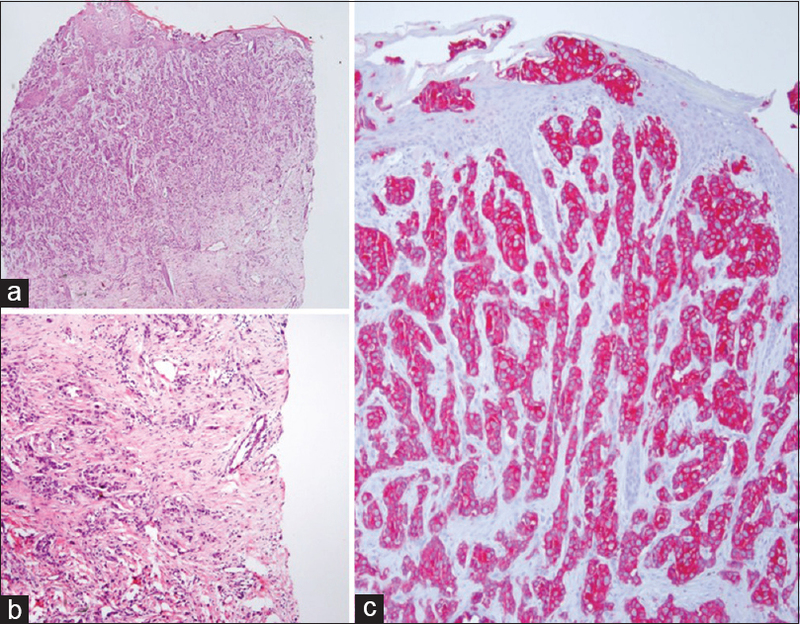 Diagnosis was confirmed by histopathological examination using hematoxylin and eosin stain. 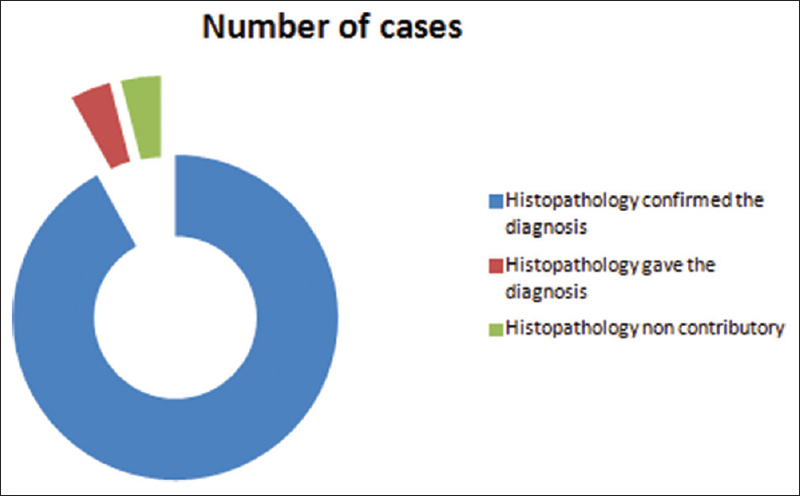 Cases were tabulated according to the distribution of age, gender, localization of lesions, clinical, and histopathological diagnosis. Results: Majority of the patients were in the 20–40 years age group (66%) with slight female preponderance (52%). The limbs (42%) were most frequently involved site. 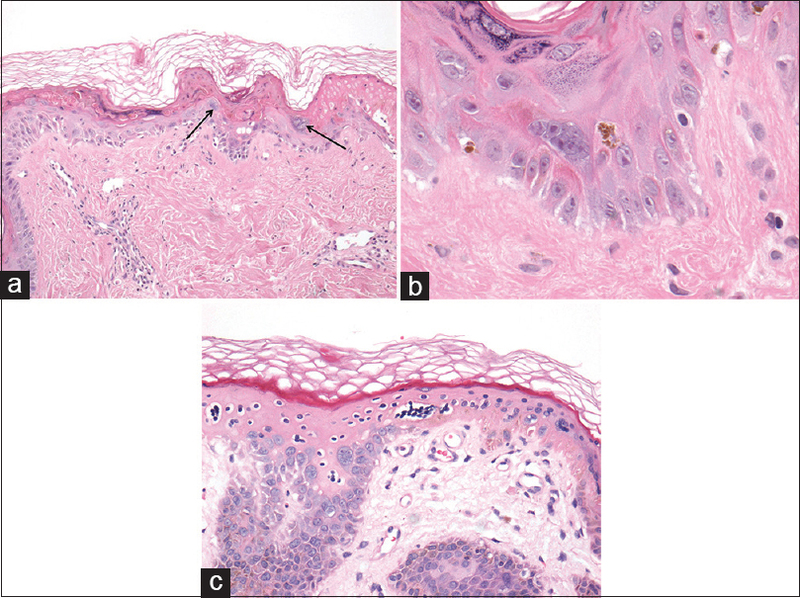 Histopathologically, lichen planus was the most common (52%) followed by psoriatic lesions (20%), pityriasis rosea (4%), pityriasis rubra pilaris (4%), subacute cutaneous lupus erythmatosus (4%), prurigo simplex (4%), pityriasis lichenoides chronica (4%), urticaria (2%) and ashy dermatosis (2%). Correlation of clinical with histopathological diagnosis was positive in 92% cases and negative in 8% cases. Conclusion: The contribution of histopathology to the final diagnosis was significant. Skin biopsy is thus valuable in daily dermatology practice and appropriate clinicopathological correlation is very important for the effective diagnosis and treatment of patients. 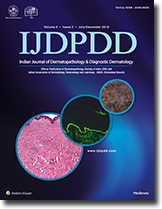 Dermatopathology is an indispensable tool for dermatologists as well as pathologists. Hence, continuous medical education (CME) on Dermatopathology was hosted by the departments of Dermatology and Pathology on September 15-16, 2018. This program was a witness to some of the lucid presentations by distinguished faculty. Around 253 delegates attended this academic feast which was a day and a half affair. The term “collision tumor” implies the occurrence of two or more neoplasms in a single biopsy specimen. This is a rare feature in skin biopsies, with most of the reported combinations involving melanocytic lesions or basal cell carcinomas. Combinations of adnexal tumors are found very sporadically. 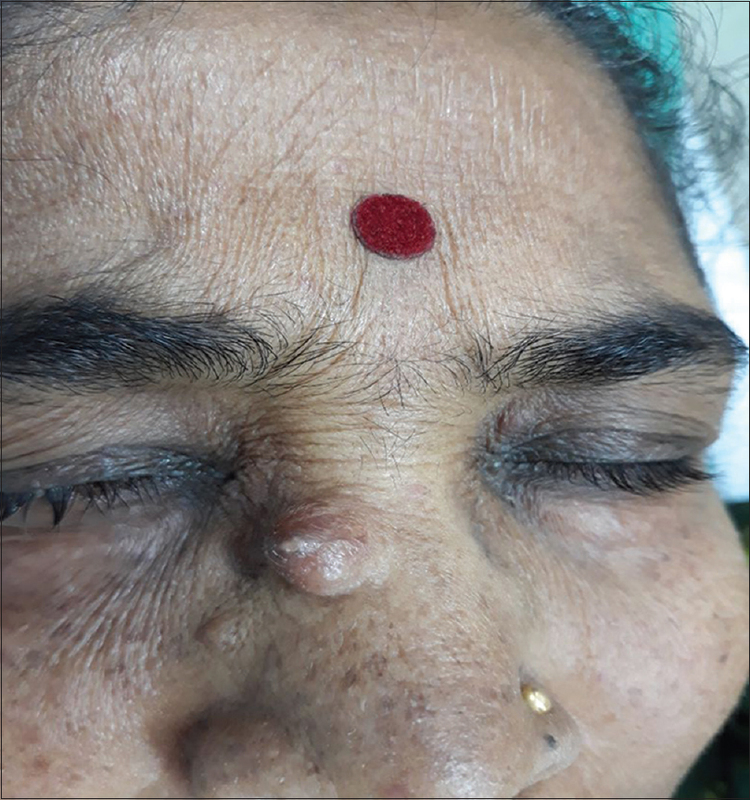 We report a 67-year-old woman with a scalp nodule, clinically suspected to be verrucous carcinoma, who underwent a wide excision. Histopathology showed apocrine poroma with adjacent regressing pilomatricoma. 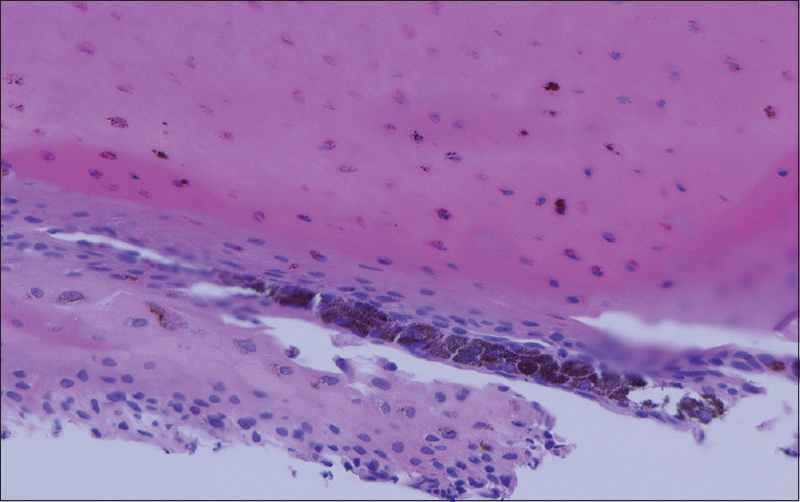 Eccrine poroma (EP) is a benign neoplasm of sweat glands originating from the terminal intraepidermal eccrine duct. 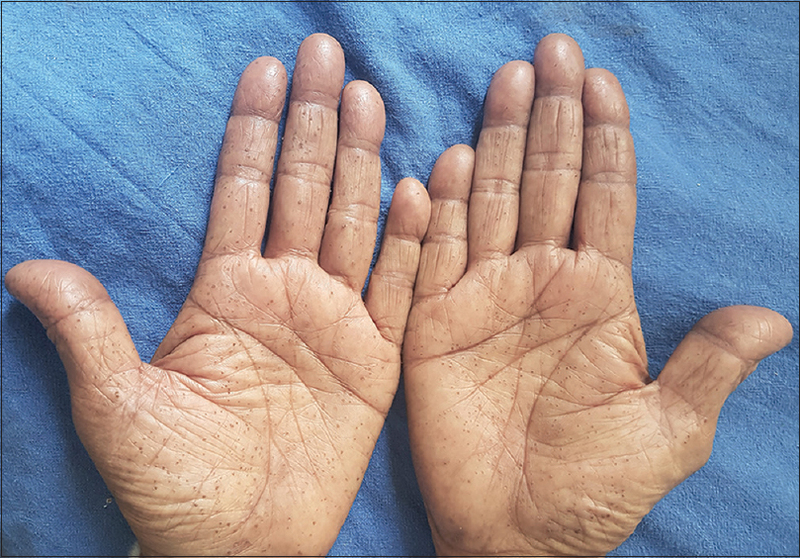 This tumor is generally known to present over acral locations, most commonly over palmar and plantar surfaces; however, it has also been documented on the trunk, face, and neck region. EP over the auricle is rarely reported. We are reporting a 71-year-old male who presented with a mass in the right retroauricular region, which was histopathologically suggestive of EP. Orofacial granulomatosis (OFG) comprises a group of diseases characterized by noncaseating granulomatous inflammation affecting the soft tissues of the oral and maxillofacial region. The classic presentation of OFG is a nontender recurrent labial swelling that eventually becomes persistent; however, the clinical presentation can be highly variable, making the diagnosis difficult to establish. Herein, we report the rare case of a 15-year-old patient, suffering from OFG and discoid lupus erythematosus; this coexistence of two such rare entities together hardly finds a mention in the literature. 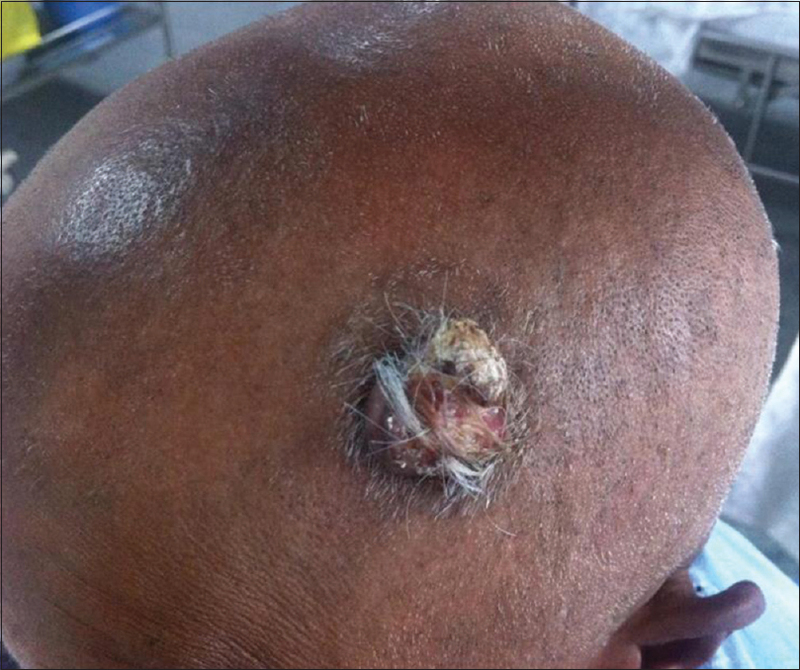 Cutaneous metastases are rare and indicate a poor prognosis. Occasionally, these may be the only presenting sign, with clinically inapparent primary source of the malignancy. 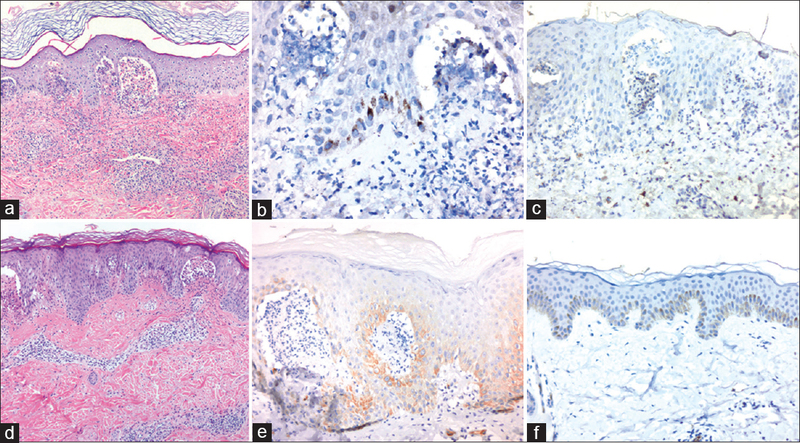 Of the various histologic patterns of cutaneous metastases, interstitial pattern is very uncommon and mimics inflammatory diseases such as granuloma annulare. 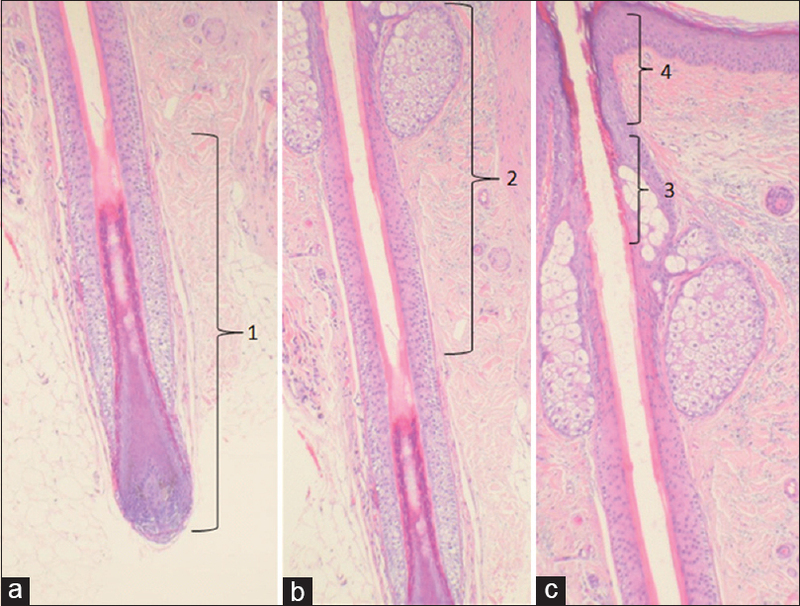 This article illustrates three such cases and underscores the role of morphology and immunohistochemical markers in establishing the correct diagnosis. Spiny keratoderma is a rare disease; first described by Brown as “punctuate keratoderma”. It is characterized by asymptomatic keratotic pin point papules over palms and soles, resembling the old fashioned music box spine. The spiny spicules are often misdiagnosed and has a very subtle histopathological difference from punctate porokeratosis. With only less than 40 cases reported worldwide, we report our case as the very few mentioned in Indian literature. Syringocystadenoma papilliferum (SCAP) is a rare skin adnexal neoplasm of apocrine gland. One-third of SCAP cases are associated with nevus of Jadassohn. 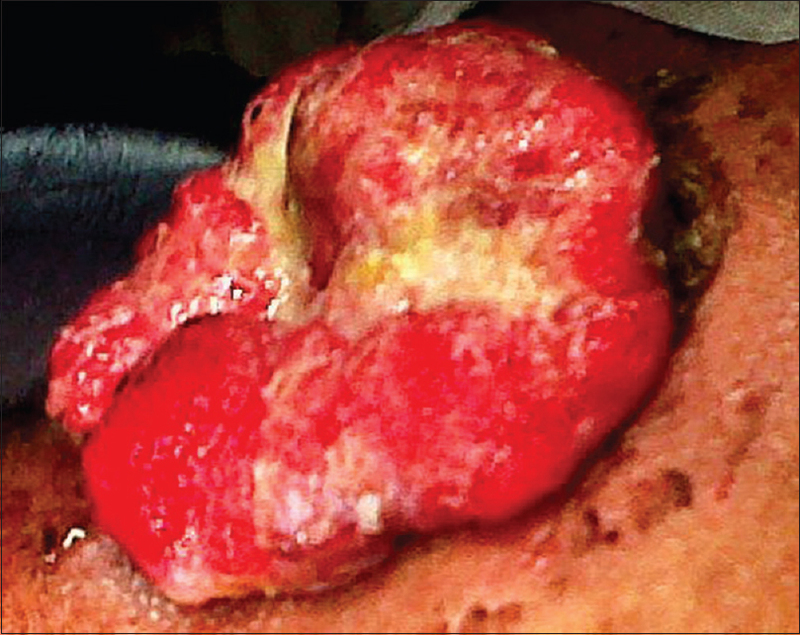 Its transition to squamous cell carcinoma is a rare entity. A strong clinical acumen, prompt excision, and confirmation by histopathology underline treatment of this cutaneous tumor. We report a case of this rare association in the deltoid region of a 55-year-old female. Cutaneous mastocytosis (CM) is a mast cell proliferative disorder that commonly affects pediatric population. It has various clinical forms such as urticaria pigmentosa, solitary mastocytoma, telangiectasia macularis eruptiva perstans, diffuse CM, and erythrodermic mastocytosis. Pseudoxanthomatous mastocytosis is a type of diffuse CM, which is relatively rare. It can mimic xanthoma disseminatum, juvenile xanthogranuloma, and benign cephalic histiocytosis which are also seen commonly in children but have different prognostic behavior. Hence, high degree of clinical suspicion along with histopathology is required for the diagnosis. Herein, we report two cases of childhood pseudoxanthomatous mastocytosis.